37 C.F.R. 1.121 Manner of making amendments in application. (b) Specification. Amendments to the specification, other than the claims, computer listings (§ 1.96 ) and sequence listings (§ 1.825 ), must be made by adding, deleting or replacing a paragraph, by replacing a section, or by a substitute specification, in the manner specified in this section. (1) Claim listing. All of the claims presented in a claim listing shall be presented in ascending numerical order. Consecutive claims having the same status of "canceled" or "not entered" may be aggregated into one statement (e.g., Claims 1–5 (canceled)). The claim listing shall commence on a separate sheet of the amendment document and the sheet(s) that contain the text of any part of the claims shall not contain any other part of the amendment. (2) When claim text with markings is required. All claims being currently amended in an amendment paper shall be presented in the claim listing, indicate a status of "currently amended," and be submitted with markings to indicate the changes that have been made relative to the immediate prior version of the claims. The text of any added subject matter must be shown by underlining the added text. The text of any deleted matter must be shown by strike-through except that double brackets placed before and after the deleted characters may be used to show deletion of five or fewer consecutive characters. The text of any deleted subject matter must be shown by being placed within double brackets if strike-through cannot be easily perceived. Only claims having the status of "currently amended," or "withdrawn" if also being amended, shall include markings. If a withdrawn claim is currently amended, its status in the claim listing may be identified as "withdrawn— currently amended." (d) Drawings : One or more application drawings shall be amended in the following manner: Any changes to an application drawing must be in compliance with § 1.84, or, for a nonprovisional international design application, in compliance with §§ 1.84(c) and 1.1026, and must be submitted on a replacement sheet of drawings which shall be an attachment to the amendment document and, in the top margin, labeled "Replacement Sheet". Any replacement sheet of drawings shall include all of the figures appearing on the immediate prior version of the sheet, even if only one figure is amended. Any new sheet of drawings containing an additional figure must be labeled in the top margin as "New Sheet." All changes to the drawings shall be explained, in detail, in either the drawing amendment or remarks section of the amendment paper. (g) Exception for examiner’s amendments. Changes to the specification, including the claims, of an application made by the Office in an examiner’s amendment may be made by specific instructions to insert or delete subject matter set forth in the examiner’s amendment by identifying the precise point in the specification or the claim(s) where the insertion or deletion is to be made. Compliance with paragraphs (b)(1), (b)(2), or (c) of this section is not required. (h) Amendment sections. Each section of an amendment document (e.g., amendment to the claims, amendment to the specification, replacement drawings, and remarks) must begin on a separate sheet. (D) when and as specifically required by the examiner. Amendments in provisional applications are not normally made. If an amendment is made to a provisional application, however, it must comply with the provisions of 37 CFR 1.121. Any amendments to a provisional application will be placed in the provisional application file, but may not be entered. All amendments filed on or after July 30, 2003 must comply with 37 CFR 1.121 as revised in the notice of final rule making published in the Federal Register on June 30, 2003 at 65 FR 38611. The manner of making amendments has been revised to assist in the implementation of beginning-to-end electronic image processing of patent applications. Specifically, changes have been made to facilitate electronic image data capture and processing and streamline the patent application process. If an amendment filed on or after July 30, 2003 does not comply with revised 37 CFR 1.121, the Office will notify applicants via a Notice of Non-Compliant Amendment that the amendment is not accepted. The revised amendment practice is summarized as follows. Each section of an amendment document (e.g., Specification Amendments, Claim Amendments, Drawing Amendments, and Remarks) must begin on a separate sheet to facilitate separate indexing and electronic scanning of each section of an amendment document for placement in an image file wrapper. (F) any drawings being submitted including any "Replacement Sheet," "New Sheet," or "Annotated Sheet." Amendments to the specification, other than the claims, computer listings (37 CFR 1.96 ) and sequence listings (37 CFR 1.825 ), must be made by adding, deleting or replacing a paragraph, by replacing a section, or by a substitute specification. In order to delete, replace or add a paragraph to the specification of an application, the amendment must unambiguously identify the paragraph to be modified either by paragraph number (see MPEP § 608.01), page and line, or any other unambiguous method and be accompanied by any replacement or new paragraph(s). Replacement paragraphs must include markings to show the changes. A separate clean version of any replacement paragraphs is not required. Any new paragraphs must be presented in clean form without any markings (i.e., underlining). Where paragraph numbering has been included in an application as provided in 37 CFR 1.52(b)(6), applicants can easily refer to a specific paragraph by number when presenting an amendment. If a numbered paragraph is to be replaced by a single paragraph, the added replacement paragraph should be numbered with the same number of the paragraph being replaced. Where more than one paragraph is to replace a single original paragraph, the added paragraphs should be numbered using the number of the original paragraph for the first replacement paragraph, followed by increasing decimal numbers for the second and subsequent added paragraphs, e.g., original paragraph  has been replaced with paragraphs , [0071.1], and [0071.2]. If a numbered paragraph is deleted, the numbering of the subsequent paragraphs should remain unchanged. 37 CFR 1.121(b)(1)(ii) requires that the full text of any replacement paragraph be provided with markings to show all the changes relative to the previous version of the paragraph. The text of any added subject matter must be shown by underlining the added text. The text of any deleted subject matter must be shown by strike-through except that double brackets placed before and after the deleted characters may be used to show the deletion of five or fewer consecutive characters (e.g., [[eroor]]). The term "brackets" set forth in 37 CFR 1.121 means square brackets – [ ], and not parentheses – ( ). The text of any deleted subject matter must be shown by being placed within double brackets if strike-through cannot be easily perceived (e.g., deletion of the number "4" must be shown as []). As an alternative to using double brackets, however, extra portions of text may be included before and after text being deleted, all in strike-through, followed by including and underlining the extra text with the desired change (e.g., number 4 as number 14 as). For added paragraphs, 37 CFR 1.121(b)(1)(iii) requires that the full text of any added paragraph(s) be presented in clean form without any underlining. Similarly, under 37 CFR 1.121(b)(1)(iv), a marked up version does not have to be supplied for any deleted paragraph(s). It is sufficient to merely indicate or identify any paragraph that has been deleted. The instruction to delete may identify a paragraph by its paragraph number, page and line number, or include a few words from the beginning, and end, or the paragraph, if needed for paragraph identification. Applicants are also permitted to amend the specification by replacement sections (e.g., as provided in 37 CFR 1.77(b), 1.154(b), or 1.163(c) ). As with replacement paragraphs, the amended version of a replacement section is required to be provided with markings to show all the changes relative to the previous version of the section. The text of any added subject matter must be shown by underlining the added text. The text of any deleted subject matter must be shown by strike-through except that double brackets placed before and after the deleted characters may be used to show the deletion of five or fewer consecutive characters. The text of any deleted subject matter must be shown by being placed within double brackets if strike-through cannot be easily perceived. Specifically regarding amendments to the abstract of the disclosure, where the amendments to the abstract are minor in nature, the abstract should be provided as a marked-up version under 37 CFR 1.121(b)(2)(ii) using strike-through and underlining as the methods to show all changes relative to the immediate prior version. Where the abstract is being substantially rewritten and the amended abstract bears little or no resemblance to the previously filed version of the abstract, a new (substitute) abstract may be provided in clean form accompanied by an instruction for the cancellation of the previous version of the abstract. The text of the new abstract must not be underlined. It would be counterproductive for applicant to prepare and provide an abstract so riddled with strike-through and underlining that its meaning and language are obscured from view and comprehension. Whether supplying a marked-up version of a previous abstract or a clean form new abstract, the abstract must comply with 37 CFR 1.72(b) regarding the length and placement of the abstract on a separate sheet of paper. Applicants are also permitted to amend the specification by submitting a substitute specification, provided the requirements of 37 CFR 1.125(b) and (c) are met. Under 37 CFR 1.125, a clean version of the substitute specification, a separate marked up version showing the changes in the specification relative to the previous version, and a statement that the substitute specification contains no new matter are required. Any previously deleted paragraph or section can only be reinstated by a subsequent amendment presenting the previously deleted subject matter. A direction by applicant to remove a previously entered amendment will not be permitted. Each amendment document that includes a change to an existing claim, including the deletion of an existing claim, or submission of a new claim, must include a complete listing of all claims ever presented (including previously canceled and non-entered claims) in the application. After each claim number, the status identifier of the claim must be presented in a parenthetical expression, and the text of each claim under examination as well as all withdrawn claims (each with markings if any, to show current changes) must be presented. The listing will serve to replace all prior versions of the claims in the application. (A) Status Identifiers: The current status of all of the claims in the application, including any previously canceled or withdrawn claims, must be given. Status is indicated in a parenthetical expression following the claim number by one of the following status identifiers: (original), (currently amended), (previously presented), (canceled), (withdrawn), (new), or (not entered). The status identifier (withdrawn – currently amended) is also acceptable for a withdrawn claim that is being currently amended. See paragraph (E) below for acceptable alternative status identifiers. Claims added by a preliminary amendment must have the status identifier (new) instead of (original), even when the preliminary amendment is present on the filing date of the application and such claim is treated as part of the original disclosure. If applicant files a subsequent amendment, applicant must use the status identifier (previously presented) if the claims are not being amended, or (currently amended) if the claims are being amended, in the subsequent amendment. Claims that are canceled by a preliminary amendment that is present on the filing date of the application are required to be listed and must have the status identifier (canceled) in the preliminary amendment and in any subsequent amendment. The status identifier (not entered) is used for claims that were previously proposed in an amendment (e.g., after-final) that was denied entry. In an amendment submitted in a U.S. national stage application, claims that were present on the international filing date or rectified pursuant to PCT Rule 91 must have the status identifier (original); claims that were amended or added under PCT Article 19 or 34 with effect in the U.S. national stage application must have the status identifier (previously presented); and claims that were canceled pursuant to PCT Article 19 or 34 with effect in the U.S. national stage application must have the status identifier (canceled). If the amendment submitted in the U.S. national stage application is making a change in a claim, the status identifier (currently amended) must be used for that claim. For any amendment being filed in response to a restriction or election of species requirement and any subsequent amendment, any claims which are non-elected must have the status identifier (withdrawn). Any non-elected claims which are being amended must have either the status identifier (withdrawn) or (withdrawn – currently amended) and the text of the non-elected claims must be presented with markings to indicate the changes. Any non-elected claims that are being canceled must have the status identifier (canceled). (B) Markings to Show the Changes: All claims being currently amended must be presented with markings to indicate the changes that have been made relative to the immediate prior version. The changes in any amended claim must be shown by strike-through (for deleted matter) or underlining (for added matter) with 2 exceptions: (1) for deletion of five or fewer consecutive characters, double brackets may be used (e.g., [[eroor]]); (2) if strike-through cannot be easily perceived (e.g., deletion of number "4" or certain punctuation marks), double brackets must be used (e.g., []). As an alternative to using double brackets, however, extra portions of text may be included before and after text being deleted, all in strike-through, followed by including and underlining the extra text with the desired change (e.g., number 4 as number 14 as ). An accompanying clean version is not required and should not be presented. Only claims of the status "currently amended" or "withdrawn" will include markings. Any claims added by amendment must be indicated as "new" and the text of the claim must not be underlined. (C) Claim Text: The text of all pending claims under examination and withdrawn claims must be submitted each time any claim is amended. The text of pending claims not being currently amended, including withdrawn claims, must be presented in clean version, i.e., without any markings. Any claim presented in clean version will constitute an assertion that it has not been changed relative to the immediate prior version except to omit markings that may have been present in the immediate prior version of the claims. A claim being canceled must be indicated as "canceled;" the text of the claim must not be presented. Providing an instruction to cancel is optional. Canceled and not entered claims must be listed by only the claim number and status identifier, without presenting the text of the claims. When applicant submits the text of canceled or not-entered claims in the amendment, the Office may accept such an amendment, if the amendment otherwise complies with 37 CFR 1.121, instead of sending out a notice of non-compliant amendment to reduce the processing time. (D) Claim Numbering: All of the claims in each amendment paper must be presented in ascending numerical order. Consecutive canceled or not entered claims may be aggregated into one statement (e.g., Claims 1 – 5 (canceled)). A canceled claim can be reinstated only by a subsequent amendment presenting the claim as a new claim with a new claim number. The original numbering of the claims must be preserved throughout the prosecution. When claims are canceled, the remaining claims must not be renumbered. For example, when applicant cancels all of the claims in the original specification and adds a new set of claims, the claim listing must include all of the canceled claims with the status identifier (canceled) (the canceled claims may be aggregated into one statement). The new claims must be numbered consecutively beginning with the number next following the highest numbered claim previously presented (whether entered or not) in compliance with 37 CFR 1.126. Claim 6 (withdrawn): A process for molding a bucket. Claim 7 (previously presented): A bucket with a handle. Claim 8 (currently amended): A bucket with a green blue handle. Claim 9 (withdrawn): The process for molding a bucket of claim 6 using molten plastic material. Claim 10 (original): The bucket of claim 8 with a wooden handle. Claim 12 (previously presented): A bucket having a circumferential upper lip. Claim 14 (new): A bucket with plastic sides and bottom. (E) Acceptable Alternative Status Identifiers : To prevent delays in prosecution, the Office will waive certain provisions of 37 CFR 1.121 and accept alternative status identifiers not specifically set forth in 37 CFR 1.121(c). See Acceptance of Certain Non-Compliant Amendments Under 37 CFR 1.121(c), OG (July 5, 2005). Accordingly claim listings that include alternative status identifiers as set forth below may be accepted if the amendment otherwise complies with 37 CFR 1.121. The Office may also accept additional variations of the status identifiers provided in 37 CFR 1.121(c) not listed above if an Office personnel determines that the status of the claims is accurate and clear. When accepting alternative status identifiers, the examiner is not required to correct the status identifiers using an examiner’s amendment. Applicant will not be notified and will not be required to submit a corrective compliant amendment. The examiner does not need to make a statement on the record that the alternative status identifiers have been accepted. Any changes to an application drawing must comply with 37 CFR 1.84 and must be submitted on a replacement sheet of drawings, even when applicant is only submitting better quality drawings without any substantive changes. Any additional new drawings must be submitted on a new sheet of drawings. The replacement or new sheet of drawings must be an attachment to the amendment document and must be identified in the top margin as "Replacement Sheet." The new drawing sheet must be identified in the top margin as "New Sheet." The replacement drawing sheet must include all of the figures appearing on the immediate prior version of the sheet, even if only one figure is amended. The figure or figure number of the amended drawing(s) must not be labeled as "amended." A marked-up copy of any amended drawing figure, including annotations indicating the changes made, may be included. The marked-up copy must be clearly labeled as "Annotated Sheet" and must be presented in the amendment or remarks section that explains the change to the drawings. A marked-up copy of any amended drawing figure, including annotations indicating the changes made, must be provided when required by the examiner. An explanation of the changes made must be presented in the "Amendments to the Drawings" or the remarks section of the amendment document. If the changes to the drawing figure(s) are not approved by the examiner, applicant will be notified in the next Office action. Applicant must amend the brief and detailed description of drawings sections of the specification if they are not consistent with the changes to the drawings. For example, when applicant files a new drawing sheet, an amendment to the specification is required to add the brief and detailed description of the new drawings. The proposed drawing correction practice has been eliminated. For any changes to the drawings, applicant is required to submit a replacement sheet of drawings with the changes made. No proposed changes in red ink should be submitted. Any proposed drawing corrections will be treated as non-compliant under 37 CFR 1.121(d). In response to any drawing objections, applicant should submit drawing changes by filing a replacement sheet of drawings or a new sheet of drawings with the corrections made. A letter to the official draftsman is no longer required. Drawing submissions without any amendments to the specification and claims after allowance should be forwarded to the Office of Data Management. 37 CFR 1.121(g) permits the Office to make amendments to the specification, including the claims, by examiner’s amendments without paragraph/section/claim replacement in the interest of expediting prosecution and reducing cycle time. Additions or deletions of subject matter in the specification, including the claims, may be made by instructions to make the change at a precise location in the specification or the claims. Examiner’s amendments do not need to comply with paragraphs (b)(1), (b)(2), or (c) of 37 CFR 1.121. See MPEP § 1302.04. (C) correct the improper status identifiers by instructions in an examiner’s amendment. The examiner’s amendment should include the reason why the amendment is non-compliant and indicate how it was corrected. Authorization from the applicant or attorney/agent of record and appropriate extensions of time are not required if the changes are not substantive (e.g., corrections of format errors or typographical errors). Such an examiner’s amendment may be made after the time period for reply, or after the shortened statutory period without any extensions of time, as long as the non-compliant amendment was timely filed. Authorization and appropriate extensions of time are required if the changes made in the examiner’s amendment are substantive (e.g., the examiner’s amendment would include a cancellation of a claim or change the scope of the claims). The authorization must be given within the time period for reply set forth in the last Office action. See MPEP § 1302.04. (A) A preliminary amendment filed after the filing date of the application, the technical support staff (TSS) will send the notice which sets a time period of two months for reply. No extensions of time are permitted. Failure to submit a timely reply will result in the application being examined without entry of the preliminary amendment. Applicant’s reply is required to include the corrected section of the amendment. (B) A preliminary amendment that is present on the filing date of the application, the Office of Patent Application Processing (OPAP) will send applicant a notice (e.g., Notice to File Corrected Application Papers) which sets a time period of 2 months for reply. Extensions of time are available under 37 CFR 1.136(a). Failure to reply to the (OPAP) notice will result in abandonment of the application. Applicant’s reply is required to include either a substitute specification under 37 CFR 1.125 if the amendment is to the specification, or a complete claim listing under 37 CFR 1.121(c) if the amendment is to the claims. (C) A non-final amendment including an amendment filed as a submission for an RCE, the TSS will send the notice which sets a time period of two months for reply. Extensions of time are available under 37 CFR 1.136(a). Failure to reply to this notice will result in abandonment of the application. Applicant’s reply is required to include the corrected section of the amendment. (D) An after-final amendment, the amendment will be forwarded in unentered status to the examiner. 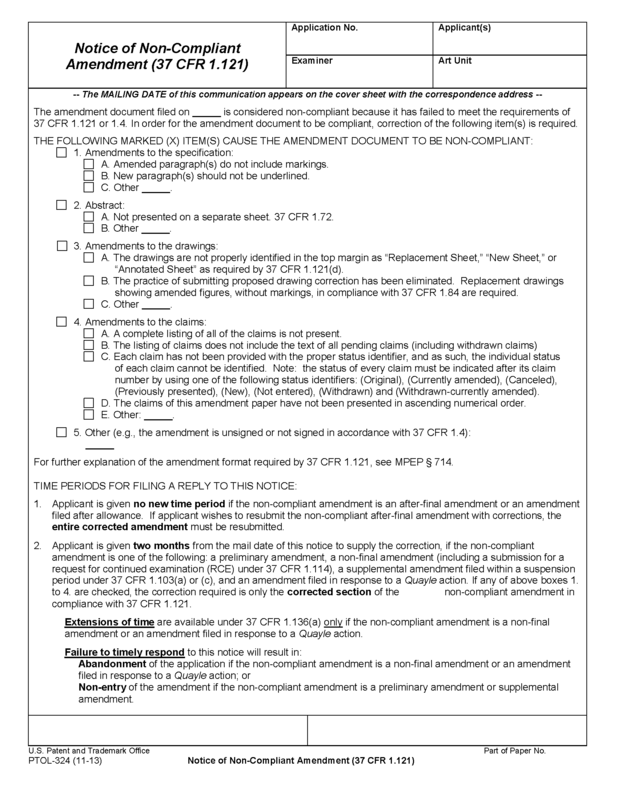 In addition to providing reasons for non-entry when the amendment is not in compliance with 37 CFR 1.116 (e.g., the proposed amendment raises new issues that would require further consideration and/or search), the examiner should also indicate in the advisory action any non-compliance in the after-final amendment. The examiner should attach a Notice of Non-Compliant Amendment to the advisory action. The notice provides no new time period for correcting the non-compliance. The time period for reply continues to run from the mailing of the final Office action. Applicant still needs to respond to the final Office action to avoid abandonment of the application. If the applicant wishes to file another after-final amendment, the entire corrected amendment (not only the corrected section of the amendment) must be submitted within the time period set forth in the final Office action. (E) A supplemental amendment filed when there is no suspension of action under 37 CFR 1.103(a) or (c), the amendment will be forwarded to the examiner. Such a supplemental amendment is not entered as a matter of right. See 37 CFR 1.111(a)(2)(ii). The examiner will notify the applicant if the amendment is not approved for entry. The examiner may use form paragraph 7.147. See MPEP § 714.03(a). (F) A supplemental amendment filed within a suspension period under 37 CFR 1.103(a) or (c) (e.g., applicant requested a suspension of action at the time of filing an RCE), the TSS will send the notice which sets a time period of two months for reply. No extensions of time are permitted. Failure to submit a timely reply will result in the application being examined without entry of the supplemental amendment. Applicant’s reply is required to include the corrected section of the amendment. (G) An amendment filed in response to a Quayle action, the TSS will send the notice which sets a time period of 30 days or one month, whichever is later, for reply. Extensions of time are available under 37 CFR 1.136(a). Failure to reply to this notice will result in abandonment of the application. Applicant’s reply is required to include the corrected section of the amendment. (H) An after-allowance amendment under 37 CFR 1.312, the amendment will be forwarded to the examiner. Amendments under 37 CFR 1.312 are not entered as matter of right. The examiner will notify the applicant if the amendment is not approved for entry. The examiner may attach a Notice of Non-Compliant Amendment (37 CFR 1.121 ) to the form PTO-271, Response to Rule 312 Communication (see MPEP § 714.16(d)). The notice provides no new time period. If applicant wishes to file another after-allowance amendment under 37 CFR 1.312, the entire corrected amendment must be submitted before the payment of the issue fee. Any amendments (including after-final amendments) that add new claims in excess of the number of claims previously paid for in an application must be accompanied by the payment of the required excess claims fees. Failure to pay the excess claims fees will result in non-entry of the amendment. See MPEP § 607. The directions for the entry of an amendment may be defective. Examples include inaccuracy in the paragraph number and/or page and line designated, or a lack of precision where the paragraph or section to which insertion of the amendment is directed occurs. If the correct place of entry is clear from the context, the amendatory paper will be properly amended in the Technology Center and notation thereof, initialed in ink by the examiner, who will assume full responsibility for the change, will be made on the margin of the amendatory paper. In the next Office action, the applicant should be informed of this alteration in the amendment and the entry of the amendment as thus amended. The applicant will also be informed of the nonentry of an amendment where defective directions and context leave doubt as to the intent of applicant. When a replacement paragraph or section of the specification is to be amended, it should be wholly rewritten and the original insertion canceled. A marked-up version of the replacement paragraph or section of the specification should be presented using underlining to indicate added subject matter and strike-through to indicate deleted subject matter. Matter canceled by amendment can be reinstated only by a subsequent amendment presenting the canceled matter as a new insertion. A claim cancelled by amendment (deleted in its entirety) may be reinstated only by a subsequent amendment presenting the claim as a new claim with a new claim number. (C) when and as specifically required by the examiner. See also MPEP § 714.12. For amendments in ex parte reexamination proceedings see MPEP § 2250 and § 22.6. For amendments by patent owner in an inter partes reexamination proceeding, see MPEP § 2666.01 and § 2672. For amendments in reissue applications, see MPEP § 1453.